Of course, I couldn’t venture to Europe without my camera and I took many photographs to document my trip. I sat down with Kitty to discuss some of the images and share my experiences. I hope you enjoy the images. I sure enjoyed making them. Kitty: So, Panache – you made it to France for the Tour! Did it live up to your expectations? Panache: It was well beyond my expectations. Everything was bigger and more beautiful than I imagined. It’s hard to understand the scale of the Tour until you actually see it in person. Kitty: Climbing Mont Ventoux must have been amazing. What was it like? Was it as difficult as you thought it would be, easier, or just different? Panache: Ventoux juts into the sky like an impenetrable fortress. The climb to the summit is roughly 21km long with an average gradient of 7.5% and we took the same route the Tour riders rode a few hours later. As we began the ascent, the number of people cheering us on amazed me – it was said there were over a million people on the mountain to see the race. Kitty: What do your legs feel like when you’re on that really steep section? Panache: My legs burned on the steep forest sections, but I was so excited about being there that the pain was more like pleasure. I know that sounds strange. Kitty: Sounds like something Jens would say, actually! Panache: A little over an hour into the ride, we came through the trees into the famous ‘moonscape’. I saw the weather station at the summit, thinking I was close to the top, but no matter how much we pedalled, it never seemed to get closer! Finally two hours and 20 minutes after leaving Malaucene, we reached the summit and it was breathtaking! After several hours in the saddle, you just get used to hurting but I couldn’t believe how far we had come. Kitty: A friend of mine rode some of the Pyrenean climbs and he said there was a certain solitude to it that is really intoxicating. Did you feel that or were there just too many people? Panache: There were so many people on Ventoux but whenever you do an HC climb there are moments when you feel alone. It’s just you and the mountain – gravity versus determination. Fortunately for me, determination always won. I never stopped on any of the climbs and I noticed that we seemed to be climbing faster than most of the other riders. It felt good to know that I was prepared. Kitty: Is the descent scary? What’s it like – what do you think when you’re whizzing down a mountain? I’d be afraid I was thinking too much and accidentally think my way into a ditch or over a cliff! Panache: The descent down Ventoux is thrilling. You can reach really high speeds because it’s not too technical. It was cold and I shivered going down. What took us hours to climb only took 23 minutes to descend as we reached speeds above 85kph! Was it scary? Well, there were some scary moments. For instance, the Lampre team bus cut a corner as Chad was coming down and he had to take a pretty extreme line at high speed not to get flattened by that pink monstrosity! Kitty: What about Galibier? You said when I saw you in Paris that this was the highlight of your trip. Why? 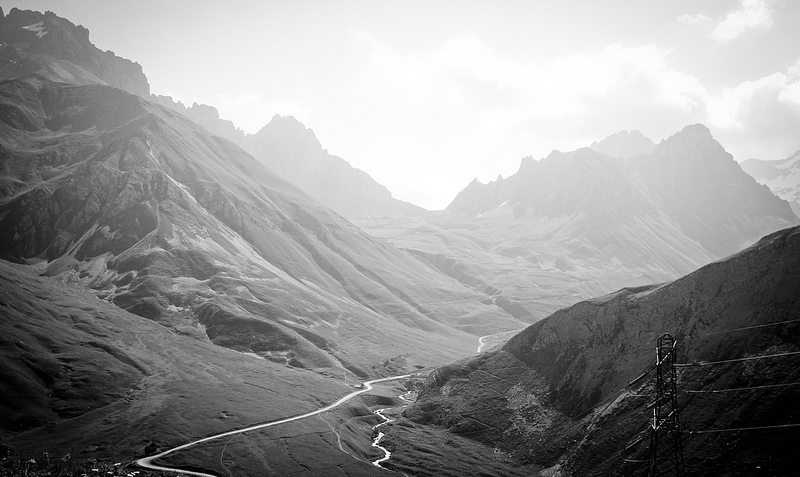 Panache: The day after we summited Ventoux, we conquered the Col du Lautaret and Col du Galibier in succession on the same ride. The weather was perfect. There were very few cars on the roads. Of all the cycling I’ve done in my life, climbing these two Cols has to be my favourite ride ever. I have never seen a landscape so beautiful while on a bike. I enjoyed seeing old paint of riders’ names on the road as we went up. There is so much Tour history there. 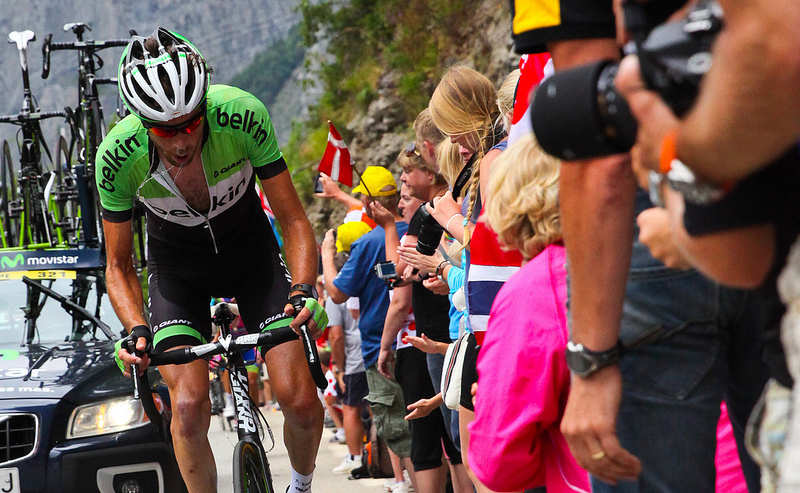 Several times I actually pretended that I was Andy Schleck attacking in the 2011 Tour. I know it’s silly but I couldn’t help it. I felt like a kid on Christmas morning. The visual stimuli, the speeds, and the sounds of my own breathing made my imagination go wild. I felt that certain solitude that your friend mentioned. Panache: I reached the summit several minutes after Scott and Chad, who are much smaller and lighter than I am. When I arrived they had huge smiles on their faces. They had experienced the same thing! I felt like crying because of the gratitude I felt for just having the opportunity to do what I was doing. I said a silent prayer of thanks, we took lots of pictures and then we set off to descend what we had just climbed. 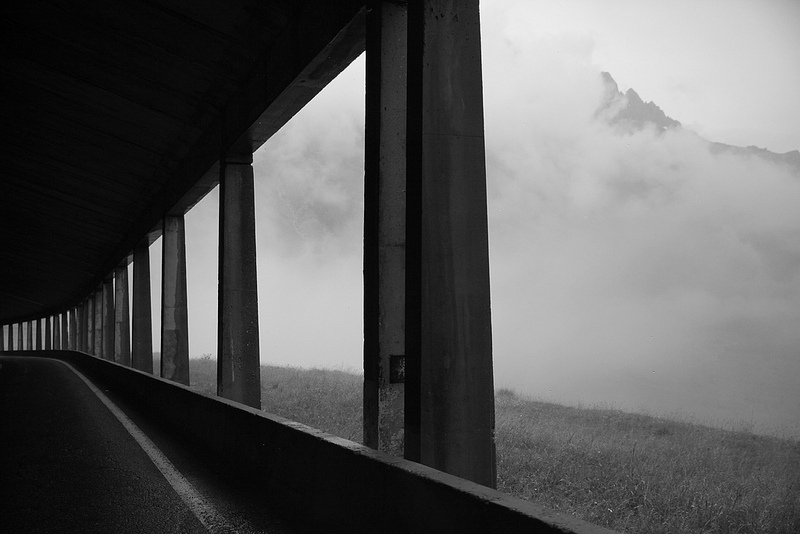 I couldn’t believe how fast we were going – 60-80kph down the Lautaret. I was sitting on my top tube trying to keep up! I got gapped a bit and was solo when my front tyre exploded at 70kph! Somehow I kept the bike upright and, since my tire was shredded, I had to wait for the guys to come and pick me up. Gave me some time to think about the pros and the speeds at which they descend – total respect! Me and Scott with some crazy Norwegians – what a fun group! 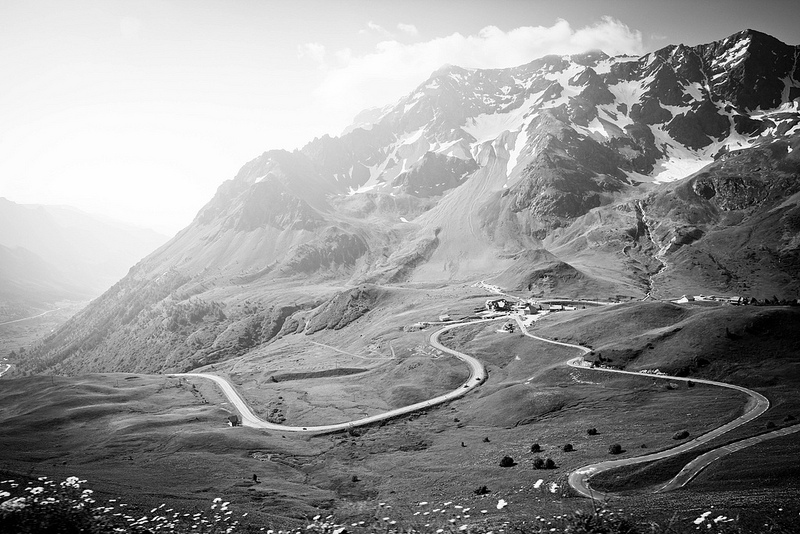 Kitty: Then of course, there was the race itself – and you were on Alpe d’Huez in a speedo! But let’s leave that to one side for now, so to speak. I always find when I’m waiting for the guys to come past that there’s this netherworld of just waiting. I almost always get to the point where I think “what am I DOING?” but as soon as the helicopters start to appear, there’s just such a thrill! 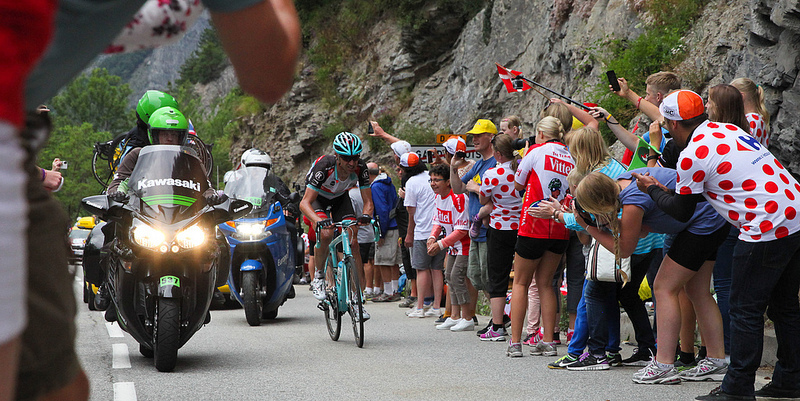 What was it like on the Alpe? 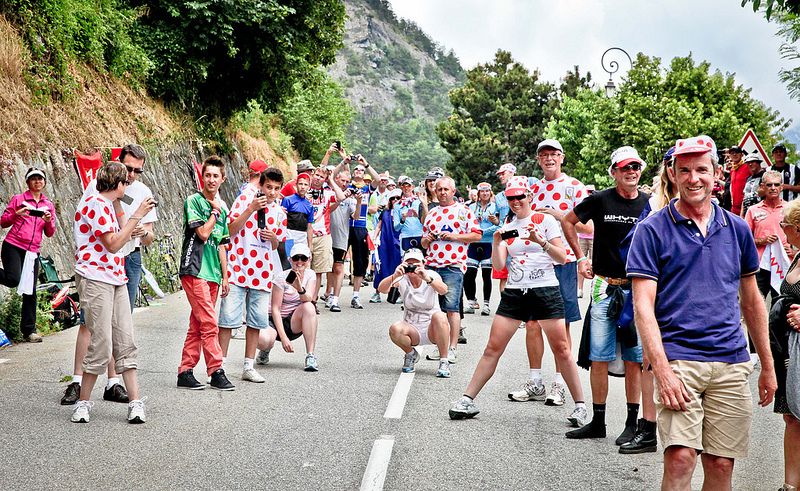 Panache: Everywhere we went the fans were incredible but the crescendo of fanaticism came on the double ascent of Alpe D’Huez. 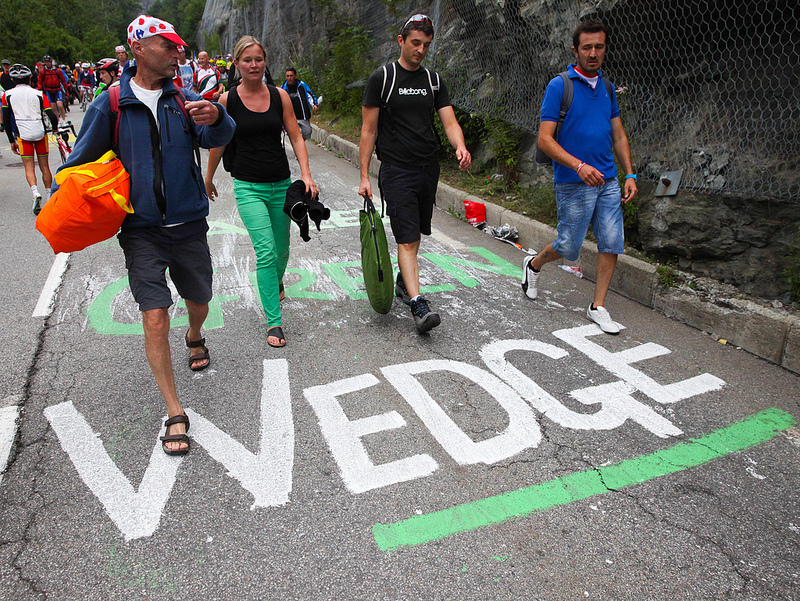 We had ridden the Alpe and the Sarenne the day before the stage and the fans were already out in force. Dutch Corner was in full party mode 28 hours before the race. 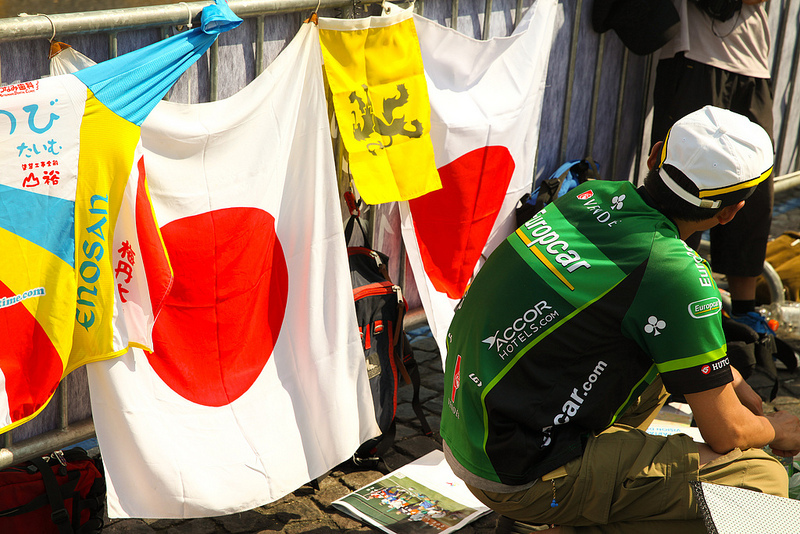 Within 100 metres of our staked-out position on corner six, there were people from Norway, Australia, the Isle of Man, Germany, Japan, Italy, Spain and the United States … all of them with a deep love of cycling. Kitty: What I do notice with fans at races is, it doesn’t matter who you like or who you don’t, everybody’s in a good mood and eager to talk about cycling. Almost in direct contrast to Twitter sometimes. Did you find that? Did you guys talk to a lot of people? Panache: We talked to everyone and they were all friendly cycling nuts! We ended up cheering next to a bunch of Aussies and Kiwis and a good number of Norwegians! It was funny how most of the Aussies expressed their displeasure with anything related to Sky and applauded anything GreenEDGE! I didn’t realise there was such a rivalry! The Norwegians were great because every so often they would just break out in song! 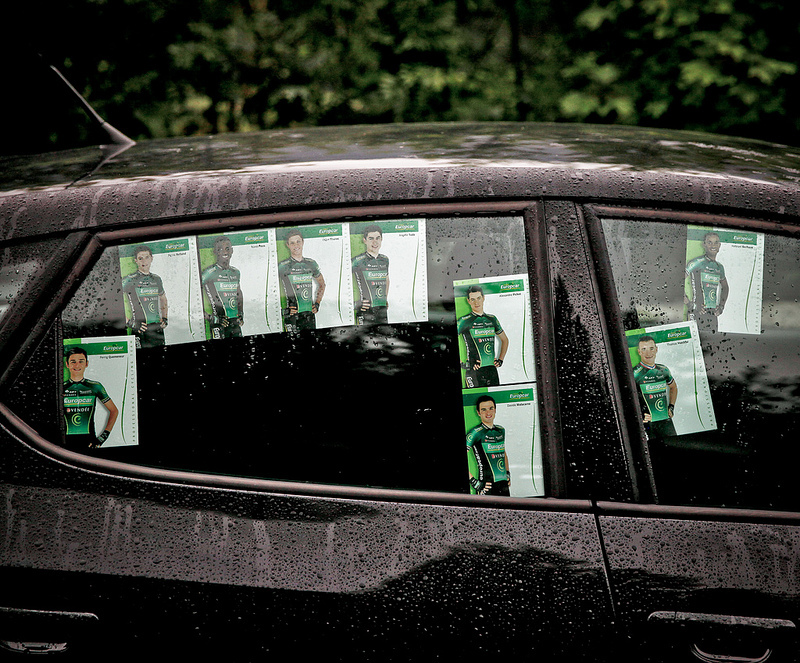 The humour of the first week’s bus incident made its way on to the climb up Alpe d’Huez! I loved that there were fans from all over the world. This guy is a die-hard Yukiya Arashiro fan! Kitty: What was it like to see the riders come up the Alpe? Panache: It was amazeballs! As the helicopter came closer, you could feel the anticipation and electricity in the air, you could hear the cheers of the crowd getting louder and louder as the riders came through each switchback. Then, all of a sudden, from around corner five, Tejay van Garderen appeared, followed by Christophe Riblon. The crowd erupted! Kitty: Who was the rider you were most happy to see? And aren’t they tiny?! Panache: I was most excited to see Johnny Hoogerland and Sylvain Chavanel and was able to see them both! I even ran near Hoogerland in my speedo! Kitty: That poor man – hasn’t Johnny suffered enough? Panache: I knew 80% of the riders’ names and faces from doing Twitter play-by-play and I cheered for them all. 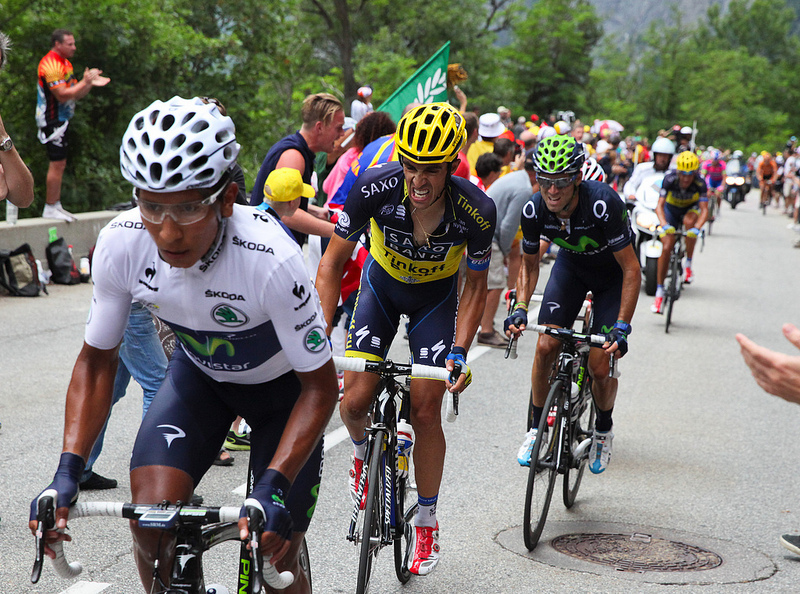 I saw Hesjedal, Talansky, Jens, Schleck, Evans, Froome, Contador, Quintana and many more. And yes, they were tiny and so lean. They made me feel fat! I’ll have body image issues the rest of my life! I was amazed how close we were to them and how fast they were going. Even the gruppetto seemed to be moving at light-speed. When they came up the second time, I was able to capture the suffering and determination on their faces. Philippe Gilbert actually made eye contact with me! We had waited eight hours for maybe eight minutes in total of actually seeing the riders but it was worth every second! I get goose bumps every time I think about it. 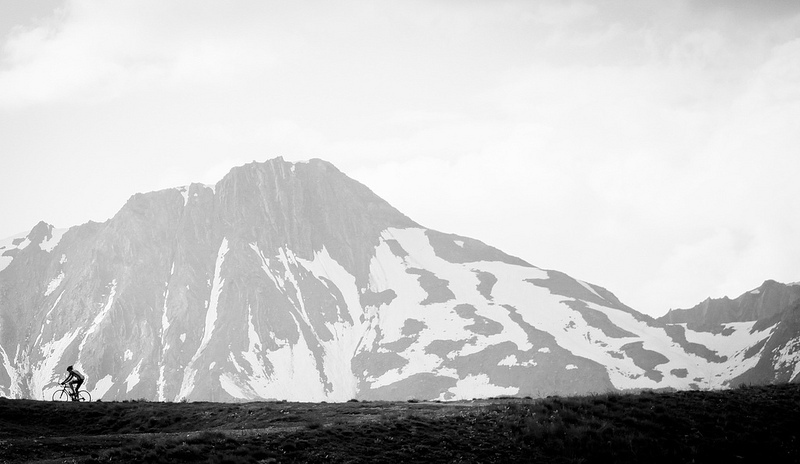 Jens was third at corner six on the second ascent of the Alpe – incredible! 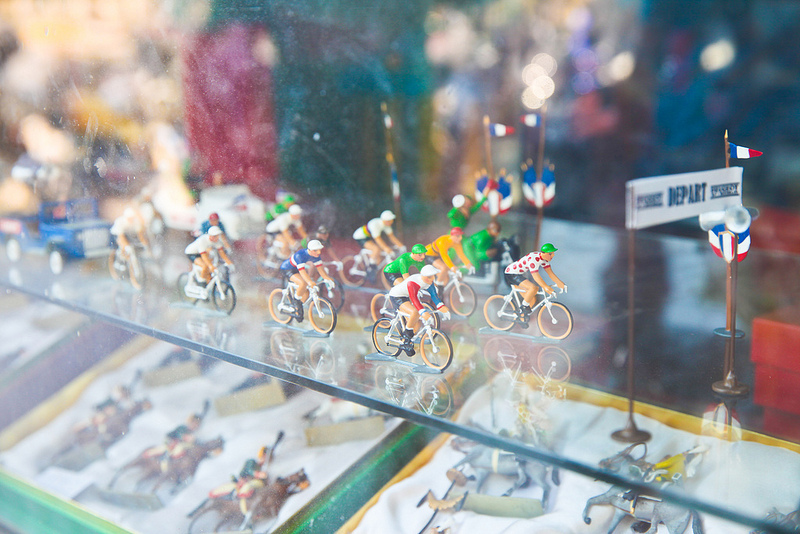 Kitty: When I went to the Giro, I found the way everyone decorated their shop windows, houses, cars, everything, really joyful. Did you find the same with the Tour? What were some of the strangest displays you saw? 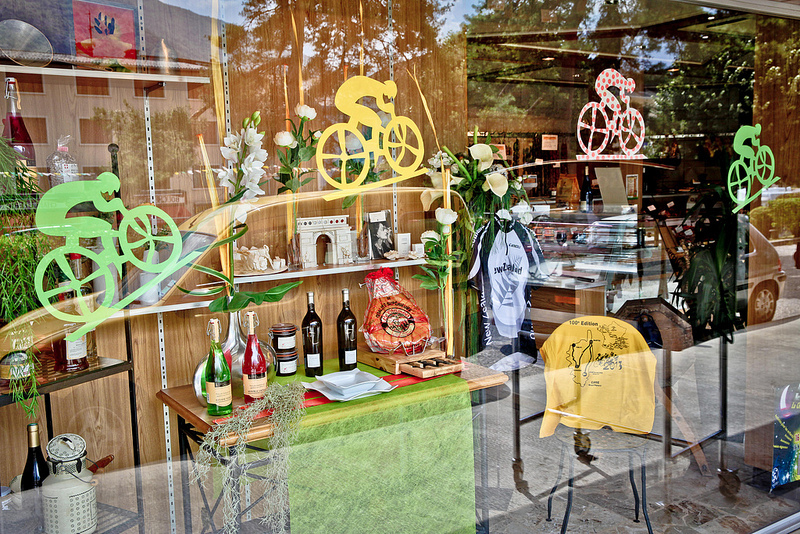 Panache: The French honour the Tour in every way possible – shop windows, cars, painted roads. Everywhere you look you see green, yellow, and white with red polka dots. France becomes obsessed and enthralled with the Tour. A bike race becomes the centre of the universe and the world stops as it goes by. It all seems like a dream. 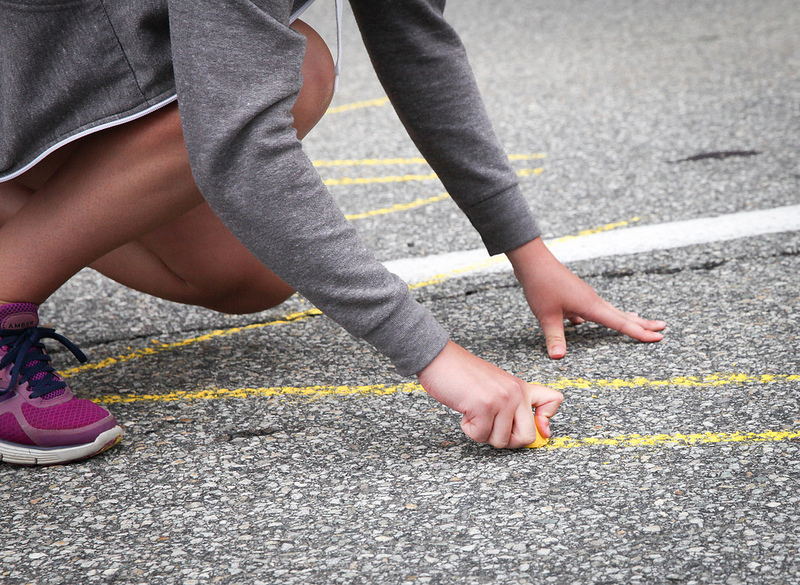 A young girl marks the road for Chris Froome. Bikes hanging from a tree near Ventoux. 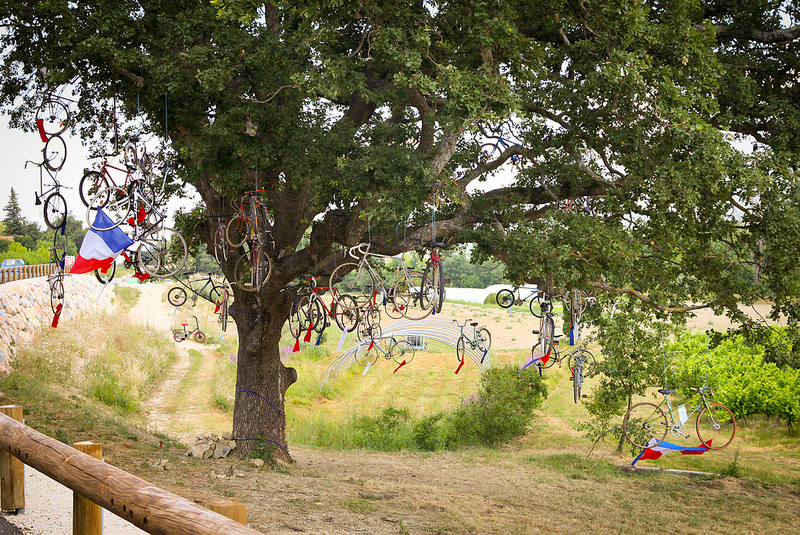 Wouldn’t it be cool if bikes really did grow on trees? Kitty: So here’s a question: when are you coming back? Panache: Ooooh, that’s a tough question. I’m considering traveling to Yorkshire next year for the start of the race and then seeing a bit of the UK! I just have to convince Mrs Panache. Keep your fingers crossed! 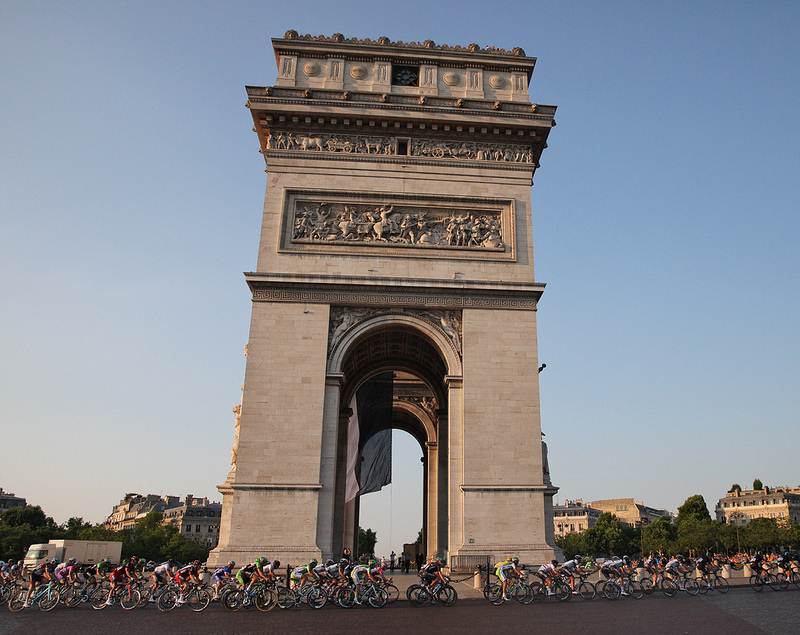 To see more images from Panache’s trip, visit his TDF set on FLICKR. 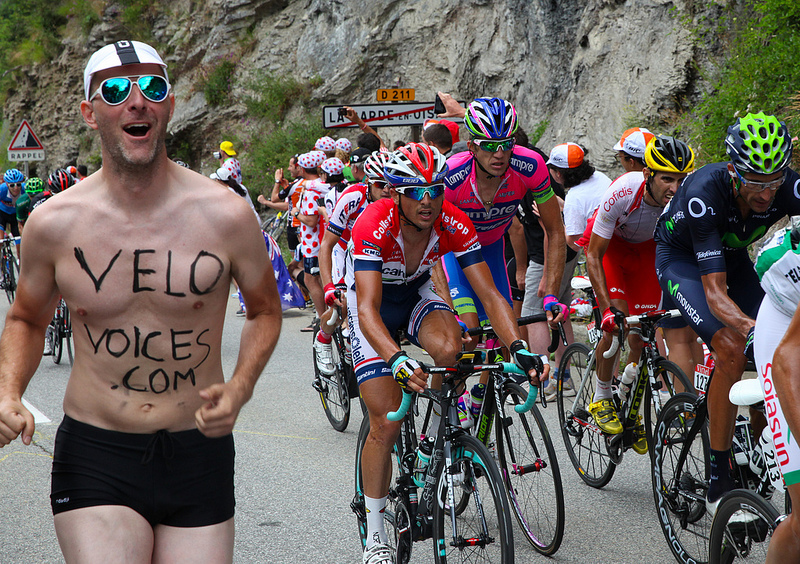 I’ve followed your twitter feed for quite a while, Panache, as well as here on Velo voices and it’s great to read this report of your time at the Tour. Here’s hoping you can persuade Mrs Panache to allow you to go to Yorkshire next year! As an Australian I must tell you that there has always been an intense rivalry between the Aussies and the Poms in all things remotely involving sport BUT because we also share a very similar sense of humour, it’s usually expressed in a dry, sardonic way. Australia and England ALWAYS vie to be the world’s greatest sledgers when it comes to sporting events. Some of the best “sledges” are between the English and Australian cricketers. Great shots and comments, Panache. I feel your passion. I too love everything about the Tour and make it my mission to get embroiled in it. I’ve been 6 times now, including the last 3 years. I especially love mixing with the locals who come out to honour the race and the privilege of having it pass through or near their homes (I think it is more special being off the landmark locations which become overrun by ‘Tour-ists’). I haven’t seen all of your photos yet, but am disappointed that I’m not in any! But, with millions lining the roads, what are the chances? I was probably at the base of Ventoux ( about 2km in from the official start of the climb) when you road it. I even road a few kms up myself on my folding bike….this is a big challenge for a crocodile – a cold blooded creature without the ability to sweat – it was a warm day, even for an Aussie! I also road in La Randonnée du Tour on the Champs Élysées with 5000 humans. That was BLOODY hot (pardon my French!). Perhaps we will cross paths at Le Tour de France in the future. I hope I can go again…and again…(if Mrs Crikey lets me, just like Mrs Panache has to let you!). I will have a big smile for you…and of course, for my friend, Cadel, even if he doesn’t ride it! 6 times in a row!! Fantastic!! What passion!! Best article ever on VV. Super pics too. 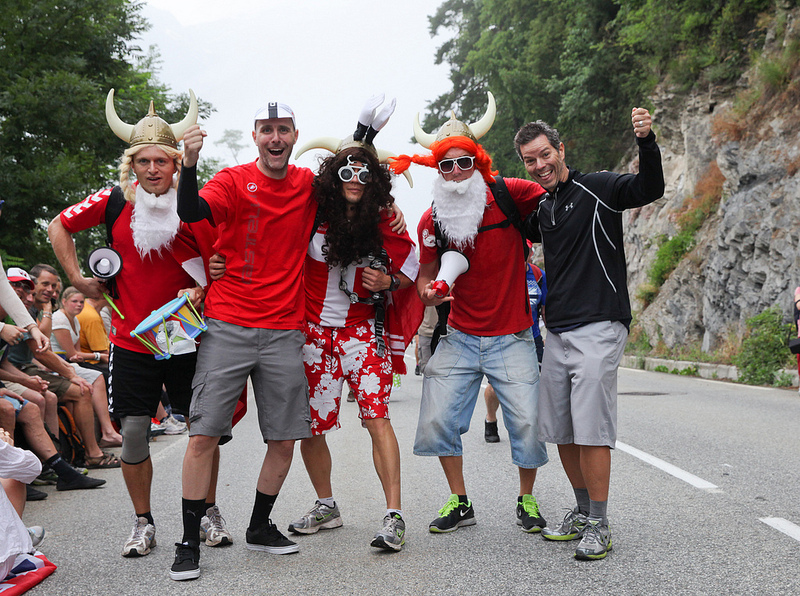 Have you got a link to a video of Panache’s antics on the Alpe?